Please note that the content of this book primarily consists of articles available from Wikipedia or other free sources online. 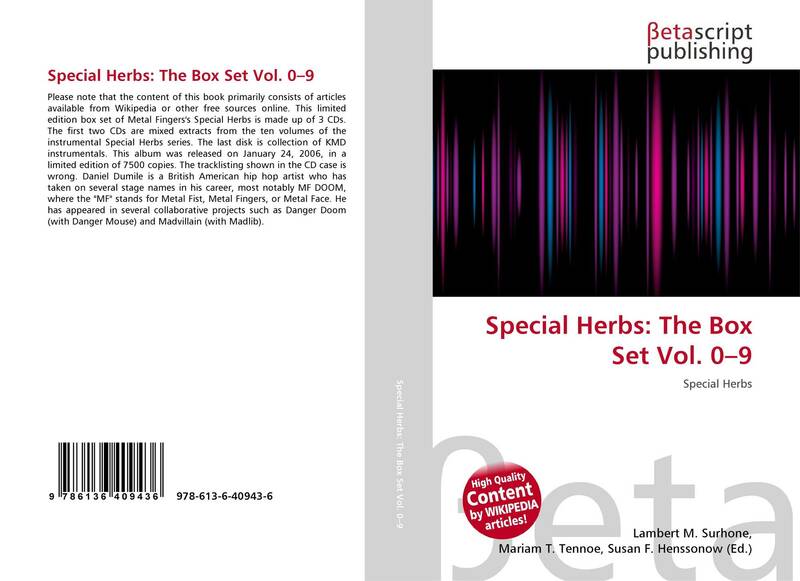 This limited edition box set of Metal Fingers's Special Herbs is made up of 3 CDs. The first two CDs are mixed extracts from the ten volumes of the instrumental Special Herbs series. The last disk is collection of KMD instrumentals. This album was released on January 24, 2006, in a limited edition of 7500 copies. The tracklisting shown in the CD case is wrong. Daniel Dumile is a British American hip hop artist who has taken on several stage names in his career, most notably MF DOOM, where the "MF" stands for Metal Fist, Metal Fingers, or Metal Face. He has appeared in several collaborative projects such as Danger Doom (with Danger Mouse) and Madvillain (with Madlib).